vaezi, E., Najafi, S., Haji Molana, M., Hosseinzadeh Lotfi, F., Ahadzadeh Namin, M. (2019). Measuring performance of a three-stage structure using data envelopment analysis and Stackelberg game. 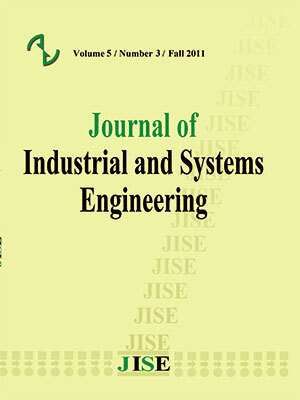 Journal of Industrial and Systems Engineering, 12(2), 151-173.
ehsan vaezi; Seyyed Esmaeil Najafi; Mohammad Haji Molana; Farhad Hosseinzadeh Lotfi; Mahnaz Ahadzadeh Namin. "Measuring performance of a three-stage structure using data envelopment analysis and Stackelberg game". Journal of Industrial and Systems Engineering, 12, 2, 2019, 151-173.
vaezi, E., Najafi, S., Haji Molana, M., Hosseinzadeh Lotfi, F., Ahadzadeh Namin, M. (2019). 'Measuring performance of a three-stage structure using data envelopment analysis and Stackelberg game', Journal of Industrial and Systems Engineering, 12(2), pp. 151-173.
vaezi, E., Najafi, S., Haji Molana, M., Hosseinzadeh Lotfi, F., Ahadzadeh Namin, M. Measuring performance of a three-stage structure using data envelopment analysis and Stackelberg game. Journal of Industrial and Systems Engineering, 2019; 12(2): 151-173. In this paper, we consider a three-stage network comprised of a leader and two followers in respect to the additional desirable and undesirable inputs and outputs. We utilize the non-cooperative approach multiplicative model to measure the efficiency of the overall system and the performances of decision-making units (DMUs) from both, the optimistic and pessimistic views. Moreover, we utilize the concept of a goal programming and define a kind of cooperation between the leader and followers, so that the objectives of the managers are capable of being inserted in the models. In actual fact, a kind of collaboration is considered in a non-cooperative game. The non-cooperative models from these view cannot be converted into linear models. Therefore, a heuristic method is proposed to convert the nonlinear models into linear models. After obtaining the efficiencies based on the double-frontier view, the DMUs are ranked and classified into three clusters by the k-means algorithm. Finally, this paper considers a genuine world example, in relevance to production planning and inventory control, for model application and analyzes it from the double-frontier view. The proposed models are simulations of a factory in a real world, with a production area as leader and a warehouse and a delivery point as two followers. This factory has been regarded as a dynamic network with a time period of 24 intervals. Amirkhan, M., Didehkhani, H., Khalili-Damghani, K., & Hafezalkotob, A. (2018). Measuring Performance of a Three-Stage Network Structure Using Data Envelopment Analysis and Nash Bargaining Game: A Supply Chain Application. International Journal of Information Technology & Decision Making, 17(05), 1429-1467. Amirteimoori, A. (2007). DEA efficiency analysis: Efficient and anti-efficient frontier. Applied Mathematics and Computation, 186(1), 10-16. An, Q., Yang, M., Chu, J., Wu, J., & Zhu, Q. (2017). Efficiency evaluation of an interactive system by data envelopment analysis approach. Computers & Industrial Engineering, 103, 17-25. Azizi, H. (2014). DEA efficiency analysis: A DEA approach with double frontiers. International Journal of Systems Science, 45(11), 2289-2300. Azizi, H., & Ajirlu, H. G. (2011). Measurement of the worst practice of decision-making units in the presence of non-discretionary factors and imprecise data. Applied Mathematical Modelling, 35(9), 4149-4156. Azizi, H., & Wang, Y. M. (2013). Improved DEA models for measuring interval efficiencies of decision-making units. Measurement, 46(3), 1325-1332. Azizi, H., Kordrostami, S., & Amirteimoori, A. (2015). Slacks-based measures of efficiency in imprecise data envelopment analysis: An approach based on data envelopment analysis with double frontiers. Computers & Industrial Engineering, 79, 42-51. Badiezadeh, T., & Farzipoor, R. (2014). "Efficiency evaluation of production lines using maximal balance index", International Journal Management and Decision Making, Vol. 13, No. 3, pp. 302-317. Badiezadeh, T., Saen, R. F., & Samavati, T. (2018). Assessing sustainability of supply chains by double frontier network DEA: A big data approach. Computers & Operations Research, 98, 284-290. Chen, C., & Yan, H. (2011). Network DEA model for supply chain performance evaluation. European Journal of Operational Research, 213 (1): 147–155. Chen, L. H., Ko, W. C., & Yeh, F. T. (2017). Approach based on fuzzy goal programing and quality function deployment for new product planning. European Journal of Operational Research, 259(2), 654-663. Cook, W.D., Zhu, J., Bi, G. & Yang, F. (2010). Network DEA: additive efficiency decomposition. European Journal of Operational Research, 207 (2): 1122– 1129. Dhahri, I., & Chabchoub, H. (2007). Nonlinear goal programming models quantifying the bullwhip effect in supply chain based on ARIMA parameters. European Journal of Operational Research, 177(3), 1800- 1810. Doyle, J. R., Green, R. H., & Cook, W. D. (1995). Upper and lower bound evaluation of multiattribute objects: Comparison models using linear programming. Organizational Behavior and Human Decision Processes, 64(3), 261-273. Du, J., Zhu, J., Cook, W. D., & Huo, J. (2015). DEA models for parallel systems: Game-theoretic approaches. Asia-Pacific Journal of Operational Research, 32(02), 1550008. Fare, R., & Grosskopf, S. (2000). "Network DEA", Socio Economics Planning Science, Vol. 4, No. 1, pp. 35–49. Fare, R., Grosskopf, S., Lovell, K., & Pasurka, C., (1989). Multilateral productivity comparisons when some outputs are undesirable: A nonparametric approach. The Review of Economics and Statistics,71, 90–98. He, Y., Gao, S., Liao, N., & Liu, H. (2016). A nonlinear goal-programming-based DE and ANN approach to grade optimization in iron mining. Neural Computing and Applications, 27(7), 2065-2081. Hwang, S. N., Chen, C., Chen, Y., Lee, H. S., & Shen, P. D. (2013). Sustainable design performance evaluation with applications in the automobile industry: Focusing on inefficiency by undesirable factors. Omega, 41(3), 553-558. Jafarian Moghaddam, A.R., & Ghoseiri, K., (2011). Fuzzy dynamic multi-objective Data Envelopment Analysis model. Expert Systems with Applications, 38, 850–855. Jahanshahloo, G.R., HosseinzadehLotfi, F., Shoja, N., Tohidi, G., & Razavyan, S. (2005). ''Undesirable inputs and outputs in DEA models", Applied Mathematics and Computation, Vol. 169, No. 2, pp. 917–925. Jahanshahloo, G. R., & Afzalinejad, M. (2006). A ranking method based on a full-inefficient frontier. Applied Mathematical Modelling, 30(3), 248-260. Jahed, R., Amirteimoori, A., & Azizi, H. (2015). Performance measurement of decision-making units under uncertainty conditions: An approach based on double frontier analysis. Measurement, 69, 264-279. Jiang, J. L., Chew, E. P., Lee, L. H., & Sun, Z. (2012). DEA based on strongly efficient and inefficient frontiers and its application on port efficiency measurement. OR spectrum, 34(4), 943-969. Jolai, F., Yazdian, S. A., Shahanaghi, K., & Khojasteh, M. A. (2011). Integrating fuzzy TOPSIS and multi-period goal programming for purchasing multiple products from multiple suppliers. Journal of purchasing and Supply Management, 17(1), 42-53. Kawaguchi, H., Tone, K., & Tsutsui, M. (2014). Estimation of the efficiency of Japanese hospitals using a dynamic and network data envelopment analysis model. Health care management science, 17(2), 101- 112. Kritikos, M. N. (2017). A full ranking methodology in data envelopment analysis based on a set of dummy decision making units. Expert Systems with Applications, 77, 211-225. Kou, M., Chen, K., Wang, S., & Shao, Y. (2016). Measuring efficiencies of multi-period and multi-division systems associated with DEA: An application to OECD countries’ national innovation systems. Expert Systems with Applications, 46, 494-510. Lee, T., Zhang, Y., & Jeong, B. H. (2016). A multi-period output DEA model with consistent time lag effects. Computers & Industrial Engineering, 93, 267-274. Li, Y., Chen, Y., Liang, L., & Xie, J. (2012). DEA models for extended two-stage network structures. Omega, 40(5), 611-618. Liu, J., Lu, L., & Wen-Min L.u. (2016). Research fronts in data envelopment analysis, Omega, Volume 58, 2016, Pages 33-45, ISSN 0305-0483. Lu, W. M., & Lo, S. F. (2007). A closer look at the economic-environmental disparities for regional development in China. European Journal of Operational Research, 183(2), 882-894. Parkan, C., & Wang, Y. M. (2000). Worst efficiency analysis based on inefficient production Frontier. Department of Management Sciences, City University of Hong Kong Hong Kong Working Paper. Ransikarbum, K., & Mason, S. J. (2016). Goal programming-based post-disaster decision making for integrated relief distribution and early-stage network restoration. International Journal of Production Economics, 182, 324-341. Rezaee, M. J., Izadbakhsh, H., & Yousefi, S. (2016). An improvement approach based on DEA-game theory for comparison of operational and spatial efficiencies in urban transportation systems. KSCE Journal of Civil Engineering, 20(4), 1526-1531. Seiford, L.M., & Zhu, J. (2002). "Modeling undesirable factors in efficiency evaluation", European Journal of Operational Research, Vol. 142, No. 1, pp. 16–20. Sengupta, J.K., (1995). Dynamic of Data Envelopment Analysis: Theory of Systems Efficiency. Springer Science & Business Media, Netherlands. Shabanpour, H., Yousefi, S., & Saen, R. F. (2017). Future planning for benchmarking and ranking sustainable suppliers using goal programming and robust double frontiers DEA. Transportation Research Part D: Transport and Environment, 50, 129-143. Shafiee, M. (2017). Supply Chain Performance Evaluation With Rough Two-Stage Data Envelopment Analysis Model: Noncooperative Stackelberg Game Approach. Journal of Computing and Information Science in Engineering, 17(4), 041002. Trivedi, A., & Singh, A. (2017). A hybrid multi-objective decision model for emergency shelter location- relocation projects using fuzzy analytic hierarchy process and goal programming approach. International Journal of Project Management, 35(5), 827-840. Wang, K., Yu, S., & Zhang, W. (2013). China’s regional energy and environmental efficiency: A DEA window analysis based dynamic evaluation. Mathematical and Computer Modelling, 58(5-6), 1117-1127. Wang, W. K., Lu, W. M., & Liu, P. Y. (2014). A fuzzy multi-objective two-stage DEA model for evaluating the performance of US bank holding companies. Expert Systems with Applications, 41(9), 4290-4297. Wang, Y. M., & Chin, K. S. (2009). A new approach for the selection of advanced manufacturing technologies: DEA with double frontiers. International Journal of Production Research, 47(23), 6663-6679. Wang, Y. M., & Lan, Y. X. (2013). Estimating most productive scale size with double frontiers data envelopment analysis. Economic Modelling, 33, 182-186. Wang, Y. M., Greatbanks, R. and Yang, J.B. Interval efficiency assessment using data envelopment analysis, Fuzzy Sets and Systems, 153(3), (2005), 347–370. Wu, J., Lv, L., Sun, J., & Ji, X. (2015). A comprehensive analysis of China's regional energy saving and emission reduction efficiency: from production and treatment perspectives. Energy Policy, 84, 166-176. Wu, J., Zhu, Q., Ji, X., Chu, J., & Liang, L. (2016). Two-stage network processes with shared resources and resources recovered from undesirable outputs. European Journal of Operational Research, 251(1), 182- 197. Yang, X., & Morita, H. (2013). Efficiency improvement from multiple perspectives: An application to Japanese banking industry. Omega, 41(3), 501-509. Yousefi, S., Soltani, R., Saen, R. F., & Pishvaee, M. S. (2017). A robust fuzzy possibilistic programming for a new network GP-DEA model to evaluate sustainable supply chains. Journal of Cleaner Production, 166, 537-549. Zhou, H., Yang, Y., Chen, Y., & Zhu, J. (2018). Data envelopment analysis application in sustainability: The origins, development and future directions. European Journal of Operational Research, 264(1), 1-16. Zhou, X., Luo, R., Tu, Y., Lev, B., & Pedrycz, W. (2018). Data envelopment analysis for bi-level systems with multiple followers. Omega, 77, 180-188.